Fort Smith City Hall is located at 523 Garrison Avenue, Fort Smith, AR 72901; phone: 479-784-2256. Photo: W.H.H. Clayton House, ca. 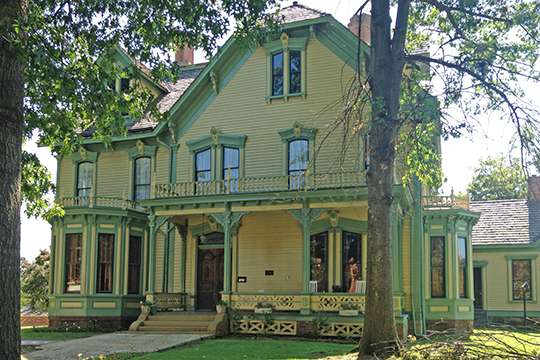 1874, 514 North 6th Street, Fort Smith, AR. Listed on the National Register of Historic Places in 1970. Photographed by User:Hakbak (own work), 2014, [cc-by-3.0 (creativecommons.org/licenses/by/3.0)], via Wikimedia Commons, accessed February, 2016. This section of Arkansas was occupied by various Native American tribes prior to European settlement. The most dominant native group of west-central to northwest Arkansas during the 1700s were the Osage. By 1817, tensions along the frontier between the tribes and settlers resulted in the U.S. Army sending troops to keep the peace in the region. The troops constructed Fort Smith on the east side of the Arkansas River on a promontory called Belle Point, where the Arkansas meets the Poteau River. The military presence allowed an influx of settlers from the east, and a community began to grow up around the fort. Early settler John Rogers opened a trading post at Fort Smith, doing business with native people and trappers. Known as the Father of Fort Smith, Rogers became the settlement's first postmaster in 1829. He laid out Garrison Avenue, the city's primary commercial district and thoroughfare. In 1838, after the army abandoned the fort to move farther west into Indian Territory, it was Rogers who convinced the military to return and build a second fort. State of Arkansas, Arkansas Historic Preservation Program, Fishback Neighborhood Historic District, Fort Smith, Sebastian County, www.arkansaspreservation.com, accessed August, 2012.